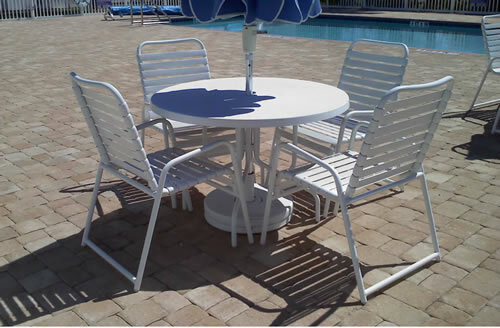 At A&K Enterprise of Manatee, Inc. we manufacture a variety of commercial strap chairs, including outdoor dining armchairs, vinyl strap sand chairs, and vinyl strap patio bar chairs, and offer them at a factory-direct discount. We offer a large selection of frame and strap colors to ensure that each strap chair is custom made to your liking. The aluminum frame is sandblasted and powder-coated to ensure that the finish won't crack or peel. The 2 inch wide straps are double-wrapped and secured with a heavy-duty solid nylon rivet. Our strap chairs are made from the highest quality extruded aluminum and are offered in a variety of tubing styles. Strap chairs are named for the vinyl strapping that makes up the seating material. Strap chairs are most often used in commercial outdoor settings. Personalize your selections and add items to your cart to receive an emailed quote including shipping costs.